These Soho clubs are traps. I’ve been here before to see Georgie Fame and Brian Auger too. A pound for a Double Diamond. Still, the Decca guy looks good for it – drives an MG, British Racing Green ducky. And with overdrive, heart. Come for a spin? Then, at last, the usual PA screech, some muffled words about success…Paris….Olympia…great to have him back…a roar from the in-crowd nearest the speakers and then…… then? Like nothing I’ve ever heard before. It wasn’t Chuck Berry but it was ‘Johnny B. Goode’. The opening riff comes screeching, coughing and barking out of the speakers like a banshee on uppers. The grace notes spill off the guitarist’s fingerboard in a torrent. Who? I yell. Hendrix. 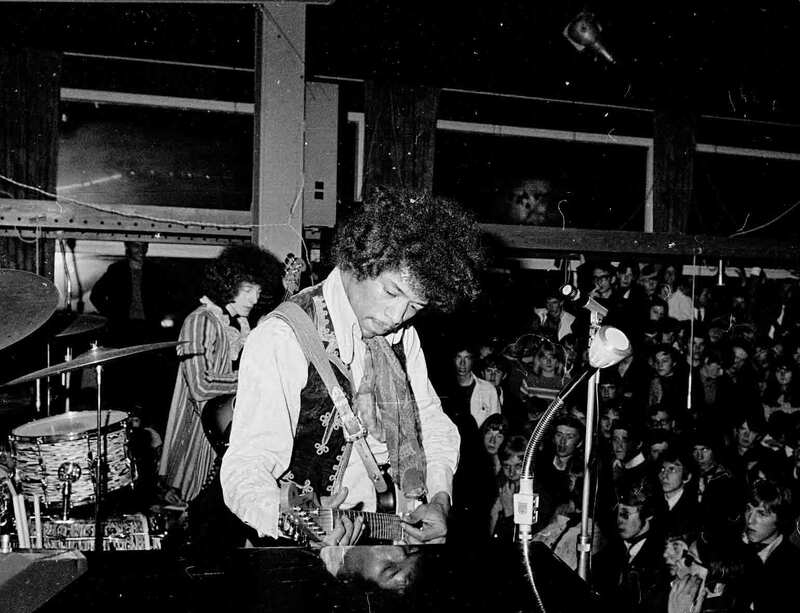 Jimi Hendrix! I push forward to get a better look. The guy, Hendrix, is something out of a book. Like a regency fop who got caught up in Arabian Nights. He seems thin and vulnerable and he struggles with the vocal but when he sings that he could play his guitar just like ringing a bell – and his strat echoes the line – all of my senses reel and I’m taking a ride. Now he’s taking his solo and the high gain amps give feed back that he controls like a lasso as it curls and shimmies around the audience. Then, oh yes, then – it dawns on me that he’s a lefty and he’s playing the strat upside down. And behind his back. And with his teeth. Another chorus followed by Berry’s riff once more, culminating in what sounds like horses neighing as he reels in the feed-back – and then a huge chord, a thwack on the snares and…..silence. Five or six seconds later a roar around the room that produces a shiver down my spine. 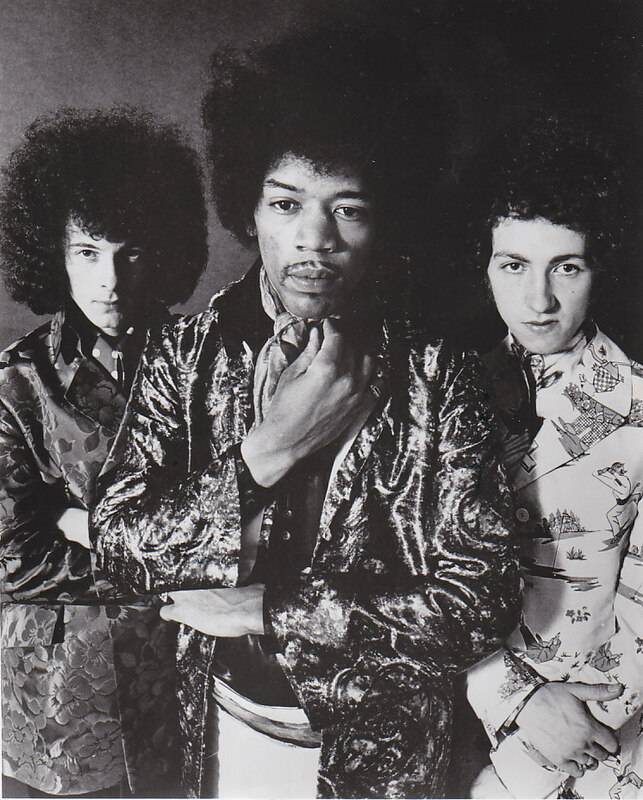 Hendrix introduces The Experience; Mitch Mitchell on drums I know from Georgie Fame’s Blue Flames; Noel Redding I’ve seen before, sitting in at gigs – except he’s not a bass player. No matter, he is now. And now they’re playing Howlin’ Wolf’s ‘Killing Floor’ In double time. Hendrix has no fear of the Gods. I’m watching the musos and journos in the audience and some of them are looking at their shoes and shaking their heads. The people I’m with look agitated and puzzled. But the people up at the front have been converted. There’s a certainty about the rapture that greets each number in the set. The band plays ‘Rock Me Baby’ and Hendrix has found his performance groove. He gyrates, closes his eyes and the strat becomes a phallus as he thrusts it back and forth, his face a mask. No lewdness, just ecstatic calm as the chops and licks fill the room – and my mind – with a vision of blues music that I doubt was real. We talk about that on the way home. We saw the fretwork. We saw that they, the musos, saw it too. We knew we’d seen and heard something. Just not quite sure what. A note from the Author; I wrote in an earlier blog, 1964, that it was said if you could remember the 60s, then you weren’t there. I have to own that and admit that I’ve had to reconstruct this account the best way I could. A good number of friends have urged me to tell these stories and I’ve done my best to relate facts and describe my feelings at the time of these events. The sources I’ve used to research and verify appear as clickables in the text. I’ve also done my best not to name drop – but to some extent it is inevitable. I played in a band, my cousin played in Brian Auger’s band and the people I hung with were into music. We went to lots of gigs. I should add that ‘RSG‘ was Ready Steady Go! – ITV’s live music show which went to air on Friday evenings at that time. I’m fairly certain that it was The Bag O’ Nails in Kingly Street, Soho, where The Experience played that night. And ‘that night’, I believe was in November 1966. I seem to remember it was bloody cold that night. But when you’re 20, immortal and in love with the world, none of that matters. This entry was posted in Bio, Music and tagged 1966, Bag O' Nails, Jimi Hendrix. Bookmark the permalink. They certainly were, Colin. And it’s enjoyable to be able to recall and share them. Thanks for your comment. 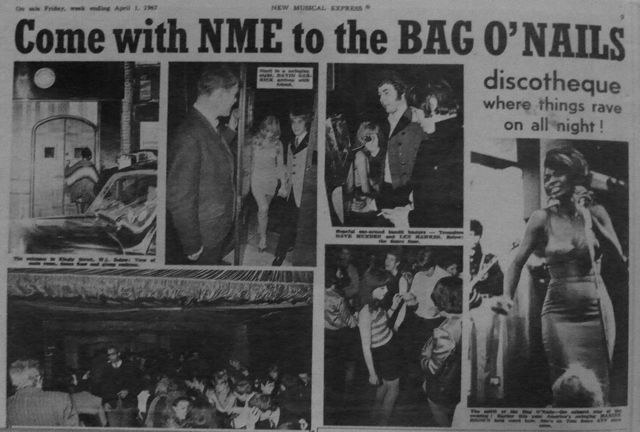 the ‘bag’ was almost home in as much as i spent more time there than anywhere else back in the day..mario on the door, telling us who was in that evening..be it paul mccartney nursing a scotch in a dark corner,.sadie the lesbian with her entourage of girls..eric burdon stoned out of his head and al the dj who was the best in london and really knew his stuff..oooh, they really were the days! Thanks Yvonne. Aye, good times. We probably were in the same place at the same time then. Did you see Hendrix? good morning! yes, i’m sure we must have pushed passed each other more than once..and yes i did see hendrix, very much so.. friend christine and i got to sit with him and eric burdon after al the dj introduced us..seems like a dream now, but nope, it happened..we sat with them all night, burdon being a drunken slob and hendrix being soft spoken, polite and amazing! at the end of the evening they asked us to go back to their hotel ‘for a drink/party’ but it was 4am and we needed to be at work in a few hours so we actually said no.. it is without a doubt the biggest regret of my life! such a shock, such a loss.. Sounds like you have some stories to tell too. I was encouraged to include some of this autobiographicaal stuff by family and friends when I started the blog. There’s another one – ‘1964’ – about Brighton which you might enjoy. There’s also one about the Munich air crash and Man Utd. I guess you’d have been at the Marquee, Scene, Crawdaddy, Whisky-A-Gogo too? I found some old programmes and odds and ends when I was researching this. Brought back a lot of memories. Me and some friends once did security for the Stones at an RSG gig and I had a whole conversation with Mick! I did speak to Eric Burdon too on a couple of occasions and yeah, he was just out of it. But Hendrix. As you say,that’s pinch yourself territory. Thanks for sharing. Kia ora. Alan.